I received a call from a frustrated woman in Hillsboro yesterday. She was hearing noises in the walls…again. Every spring she hears noises in the walls and every spring she either calls in a pest control company or tries to take care of the problem herself. She knows what she is hearing is mice because for years the pest control companies are telling her that it is mice. There are mouse droppings (the polite term for poop) all over the shelves in her garage. She has captured mice in her own traps in the garage but can’t seem to put a dent in the situation. And on top of all of this, her property sits on the border of the wetlands, where mice and other creatures flourish. I have to say that I was frustrated too. Not two minutes into my inspection, I found a possible point of entry. 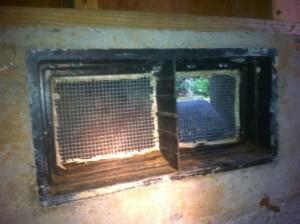 For mice, a possible point of entry is any hole larger than a dime. I usually carry a ball point pen and try poking it through any holes. If the pen fits freely, so can a mouse. Below is a picture of what I found. 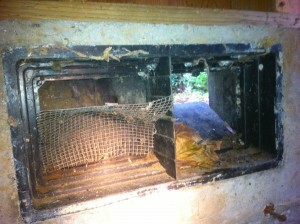 This is pretty typical actually, to find a crawl space vent that has the screen blown out or damaged. What is also typical, and what is frustrating to me, is that I found evidence of past pest control companies right next to this crawl space vent. They had placed a bait station just inside this huge hole, and placed a bait station outside the vent, and called it a day. This isn’t pest control, it is more like raking leaves in a hurricane. It took all of five minutes to seal up this access point. 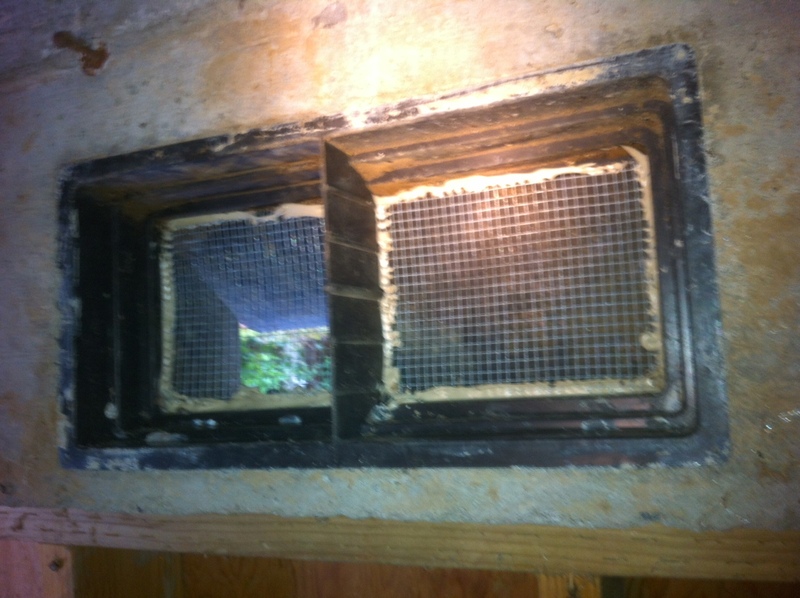 I install traps inside the crawl space and I come back to clean the traps and install new ones in two week intervals for two months. This is to ensure the house is rodent free. I would love the opportunity to win your business, but if I don’t, please ask questions as to how they are going to help you in the long run. This shouldn’t mean hooking you up to a 12 month contract. 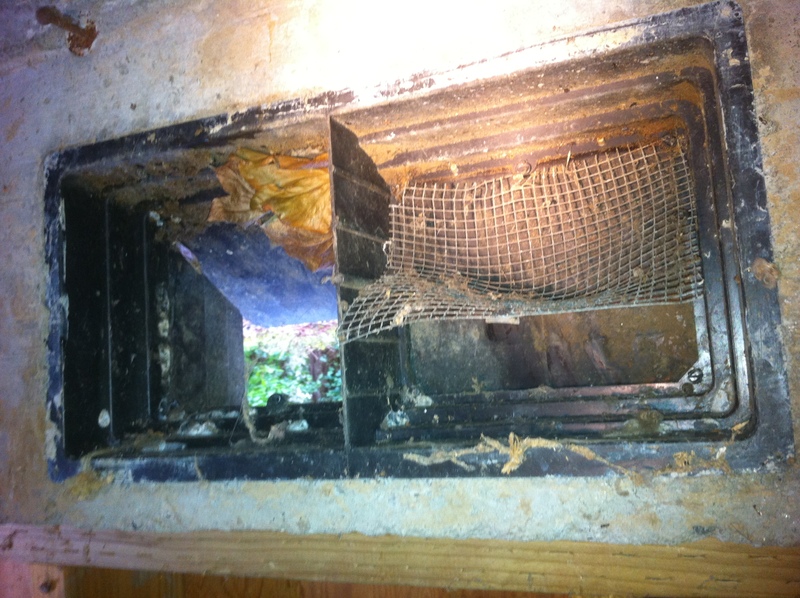 Until the access points are sealed, rodents are going to make their way into the house and this needs to be stopped. Thanks for listening! I feel a little better! 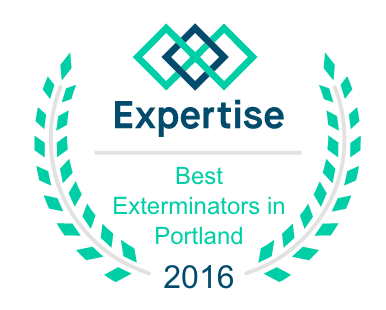 Exodus Pest Control is focused on providing superior service and customer satisfaction while using fewer chemicals and safer practices to remove pests in the Hillsboro and West Portland area.